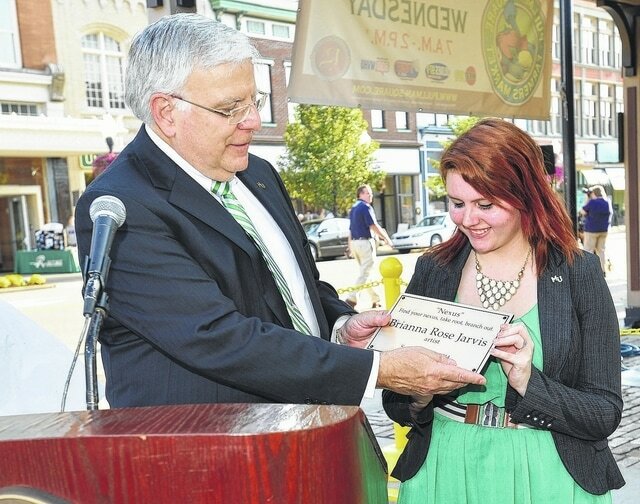 Marshall University’s late president, Dr. Stephen J. Kopp, presented graphic design student Brianna Jarvis with a plaque for the life-size bison that Jarvis decorated as part of the Visual Arts Center grand opening events, Sept. 18-20, 2014. HUNTINGTON, W.Va. — Beginning spring 2016, Marshall University’s College of Arts and Media will make an award from the Stephen J. Kopp Memorial Endowment Fund for Achievement in the Visual Arts to a student. The fund is in honor of the university’s late president, who died in December, and his wife, Jane. Established by the Marshall University Foundation Inc. to reward students’ exhibition work, the endowment will place priority with standouts from the Annual Student Juried Exhibition. Each year during his tenure, Stephen Kopp hand-selected art from the Annual Student Juried Exhibition to be featured in a special, one-year exhibition located in his office, according to Jane Kopp. School of Art and Design Director Sandra Reed said the endowment would help students finance defining experiences of their Marshall education, such as ambitious final projects, Capstone artwork and travel to New York City and Florence. “This is a most remarkable gift to support students’ creative futures,” Reed said. “Dr. Kopp had a true appreciation for the arts and recognized their importance in building a strong and vibrant community,” said Dr. Ron Area, Marshall’s senior vice president for development and CEO of The Marshall University Foundation. That kind of appreciation is perhaps most recognizable in the heart of downtown at the Visual Arts Center, but the Kopps also personally supported the university’s visual arts. In 2007, they turned to visual art students for a unique gift for donors and began sponsoring a design competition for a commemorative plate and a holiday card and, in recent years, a digital greeting. “Steve really wanted to encourage the student artists he crossed paths with,” Jane Kopp said. The 30th Annual Juried Student Exhibition can be seen April 7-May 6, 2016, at the Birke Art Gallery in Smith Hall on Marshall’s Huntington campus. For more information about Marshall’s visual arts program, visit www.marshall.edu/art or call 304-696-7299. To add to the Stephen J. Kopp Memorial Endowment Fund for Achievement in the Visual Arts, contact Krystle Davis at krystle.davis@marshall.edu or 304-696-6781.